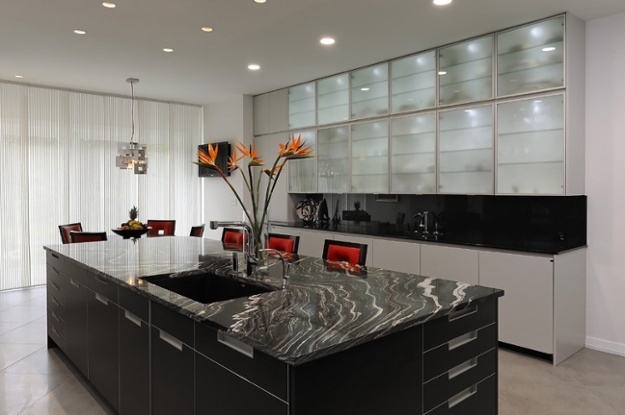 Granite countertops can be costly but are incredibly worth it. Granite is aesthetically beautiful and adds great value to your home. There are specific factors to consider before deciding on the right granite pattern for your home. Let’s delve into it so you can make a wise decision on your future stone countertop investment. You want your cabinets and granite countertops to complement each other. Many people make a very costly mistake and don’t take into consideration the color of their cabinetry before deciding on granite and realize too late how important that step is. You can actually take one of your cabinets off its hinges and bring it with you when looking at granite samples. You will be able to determine quite quickly what you like and don’t like. Certain cabinet colors can bring out certain hues in the granite you wouldn’t see without comparing it side-by-side which is why it’s so important to do this. Create a color palette that encompasses all variables including cabinetry, flooring, backsplash, and wall paint colors. Doing this will help you unite all colors of the room and help you decide on a traditional, contemporary/modern, or classic design. We recommend discussing all your options with a professional interior designer or someone who works within the granite department of the store you choose to work with. They have an eye for remodeling and have worked with every color palette imaginable so having expert advice will definitely help. Decide on a budget you are comfortable spending before shopping for granite. Some granite is more expensive than others and you don’t want to go over what you can afford otherwise you’ll regret your final decision. You not only want to enjoy the granite countertops you choose, you also want to be happy with the price you spent. It’s important to remember that no two pieces of granite are alike even within the same color scheme. Some pieces have a stronger tone than others which can throw off the entire look you are trying to achieve. Slab yards may be your best option when shopping for granite since they usually have the best quality of granite to choose from. Whether you choose gray, black, brown, or white countertops there is something for everyone. There are more rare color choices than these, but they tend to be quite a bit more expensive. Remember to stick to your budget and you won’t get sucked into something you can’t afford!